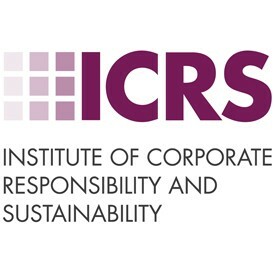 The Institute of Corporate Responsibility and Sustainability (ICRS) is the UK’s professional body for everyone committed to responsible and sustainable business. With these challenging times, it is no wonder that many of us are asking whether the rules of doing business will change, perhaps taking us back to a time when business models were neither responsible nor sustainable. As a result, our role as CRS practitioners are becoming more important and widening in scope every day. It seems the world around us is becoming more uncertain, as we begin to question whether the established rules and regulations by which we conduct business will continue in a post Brexit world. Every day, our newspapers and social media are filled with worry and concern about the continuation of workers’ rights and environmental protections, not to mention the potential cost hikes of trade tariffs, which, if introduced, would likely outweigh the offsetting influence of hard won efficiency gains. As we contemplate a possible future where the UK weakens its links with Europe and strengthens them with the US and other parts of the world, we turn our eyes to further horizons and changing circumstances. In the US, we see corporate donors have come to dominate political campaign funding; we see a mismatch in environmental standards with our own, particularly food standards; we see a reduction in overseas community aid; a U-turn on climate change policy; and the rise of ‘alternative facts’. My view is that even though the voting results of 2016 took many of us by surprise, I see no evidence that companies are minded to change the way they do business; the advantages and benefits of a responsible business model are far too compelling. It is well documented that good ESG standards and practices lower the cost of capital and result in better operational performance; that employee morale is often higher in companies with strong sustainability programmes and a sense of purpose; and that customers expect the companies they do business with to be good corporate citizens. If anything, CRS rating agencies and NGOs are raising the bar on the way we do business. For the first time, participants in this year’s Dow Jones Sustainability Index will answer questions on the amount of funding they pay to lobbyists and must list the topics for which they wish to advocate for change. CDP is encouraging companies to set Science Based carbon targets to ensure we meet the imperatives of the Paris Climate Agreement, and have begun a consultation on further improving their annual data returns, with a view to making them sector specific in 2018. ‘Business as usual’ may no longer continue to be the norm, but one thing is certain: as we move forward in these uncertain times, we will continue to follow our responsible business practices, be they regulated or not. For if we don’t, we risk unravelling the business, environmental and community benefits that we’ve worked so hard to achieve.